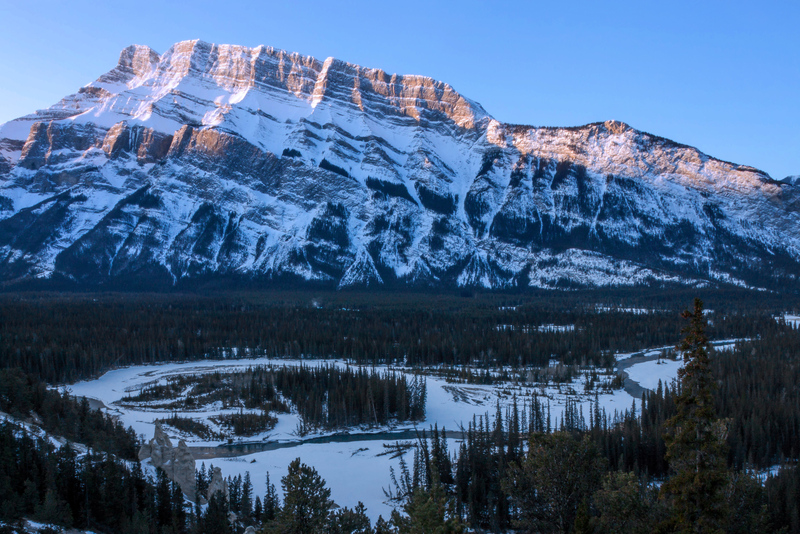 A spot that is often mentioned by photographers as one of their favorites for sunrise is the Hoodoos Viewpoint on Tunnel Mountain Road that provides views of the backside of Mount Rundle, the Bow Valley and the hoodoos (small, jutting rock formations). Maybe I just haven’t gone at the right time of year or have experienced bad light but it isn’t one of my favorite spots. I went through some old images this evening and this was among my favorites but it is still not one that I’m in love with. From this angle Mount Rundle just doesn’t look as majestic as I think it does from the other side (Vermillion Lakes area, Two Jack Lake Area, etc…). Given my viewpoint on the aesthetics of the peak it is probably not a mystery that I have a dozen or so images of the mountain from the other side but only a handful from tunnel mountain road. At this point of our trip we should be on the brink of just departing Victoria Falls in Zambia/Zimbabwe and so I thought it made sense to post a shot of a beautiful but much less impressive waterfall. Takakkaw Falls in Yoho National Park (near Banff National Park)is a nearly 1,000 foot waterfall that is easily accessible and can be viewed from the road if desired without taking the short half mile trail to this point here alongside the river. We take off on Saturday so this may be my last post for a few weeks. I will try to post some photos while overseas and if time permits I’ll schedule a few to post while we are on vacation but I have a feeling the wifi is going to be spotty over there. This is another of my favorite spots in Banff – Two Jack Lake – Sunrise and Sunset from this spot with a great view of Mount Rundle across the lake. I was up in Calgary this week but was unable to squeeze a trip to Banff in as our upcoming vacation to Africa (two weeks – EEEEKEKKEKEK) is taking up a bunch of the year’s holiday budget. I’m still hoping to squeeze a weekend in up there in May/June but it will depend on the budget at that time. For now I love going back and revisiting old pictures. This was from June last year when I drove up the Icefields Parkway and took pictures along the road during a mildly overcast day. It will likely be brief posts for the next few weeks as we prep for our trip to Africa. We are heading there pretty much on the cheap thanks to hotel points, rental car points and the plummeting Rand (15.5 to the USD). We’ve been pretty fortunate the past few years with our international travel as the strengthening dollar has helped put some funds back in our pocket! On the way to the Norquay Ski area in Banff National Park is a picnic area that sits on the side of Mount Norquay and provides stunning views of the town of Banff beneath it. In the distance (left hand side) towers Mount Rundle which regardless of where you are in the town serves as a marker given its imposing size. I could have waited for the small child in the lower left hand corner to clear the frame before shooting (or photoshopped her out) but I liked the sense of scale she provided in the image. Hopefully, it helps to give sense of size to the grandness of the landscape. I haven’t been up to Banff in awhile but I’m excited to say that we retained our client up in Calgary that I was out to bid so I’ll be heading back a couple times a year for the next few years. Each trip I may not have the luxury of making the short 90 minute drive up to Banff (like this coming trip in March which is nestled between a likely weekend in New York City for our 6th anniversary and Africa for two weeks in April) but I will certainly try more often than not. If you haven’t been and are debating I can tell you its the prettiest place in the world I’ve ever been and if you need any more incentive next year – 2017 – it will be free so you won’t even have to pay the daily visitation fee. One of the most tranquil scenes in all of Banff National Park is catching the sunrise at Two Jack Lake on the Lake Minnewanka Loop Road. The large lake has spectacular views of Mount Rundle and is one of the nicest campgrounds in the park system. Imagine – waking up to this view in the morning….yes, please! Busy week at work and then a delayed Christmas at home in Dearborn with my family. The life of a family of nurses (wife and two sisters)…..holidays never actually happen on the holiday 🙂 That’s okay, we just get to extend the joy for months to come!